Brussels Sprouts? Who serves THOSE to guests? A newly married couple in Germany, recently arrived from California, invited us over for dinner. I knew these people, our new friends, appreciated quality food. I was really looking forward to sharing their table. Then she announced she would be serving Brussels sprouts. Brussels sprouts? Really? Who eats Brussels sprouts, much less serves them to guests? I couldn’t remember the last time I had eaten them, but they just sounded bad. Bitter. Maybe a bit mushy. They were definitely somewhere on the list of yucky vegetables. But I kept my mouth shut. Don’t knock it ’til you try it, I told myself. Be a gracious guest. She said something about a balsamic reduction. Sounded fancy. A little more Williams Sonoma gourmet than I was used to. I took the first bite out of culturally obligatory politeness. The rest of the bites were taken out of shear surprise and delight. They were amazing. A tad of sweet. No mush. The distinct flavor of the Brussels sprouts was actually a good flavor. These weren’t your grandma’s prefrozen, boiled-to-death sprouts (no offense to grandmas). This new-to-me vegetable was quickly added to my list of “definitely must eat more often” vegetables. Brussels sprouts are slightly bitter, though not to a fault. For this reason, however, they are often prepared with some sort of sugar. This sugar can be a simple sugar, such as the maple sugar in the recipe below, or can be manufactured during the cooking process, such as caramelizing onions and then adding the sprouts. When it comes to dinner, I usually prefer a quick and easy method, which is what I have shared below. The best way to prepare them, however, is the way that will make you want to eat them. My daughters call brussels sprouts little cabbages and devour them when prepared as below. Don’t knock it ’til you’ve tried it. When did someone serve you something you thought you wouldn’t like, but it actually tasted great? 2 Tablespoons maple syrup – Of course, my inner chef would recommend using 100% pure maple syrup. However, any maple syrup will do, just be aware that Aunt Jemima and the like are thicker because of additives like high fructose corn syrup, which makes them more difficult to “drizzle” over the sprouts. 2 teaspoons garlic salt – OR finely dice two garlic cloves. Combine with 1/2 teaspoon salt. Mix last two ingredients in a small bowl. 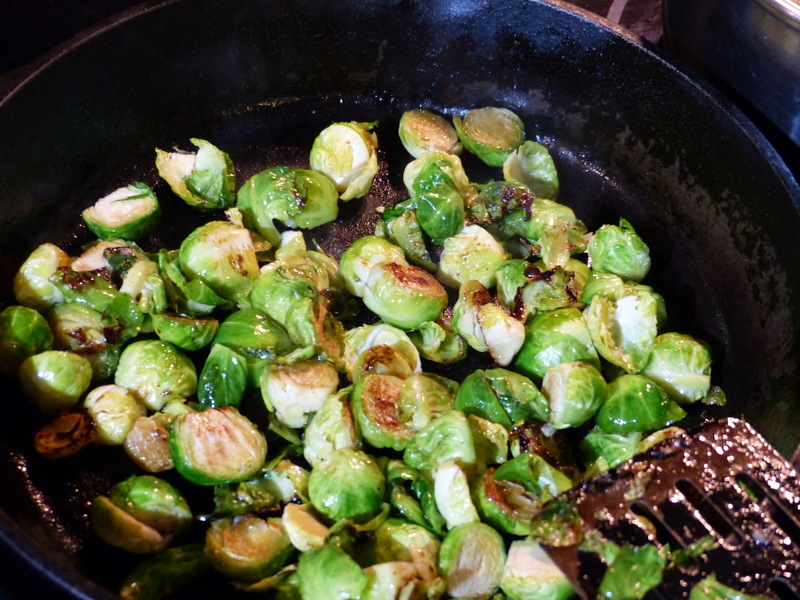 Drizzle over Brussels sprouts and toss gently. 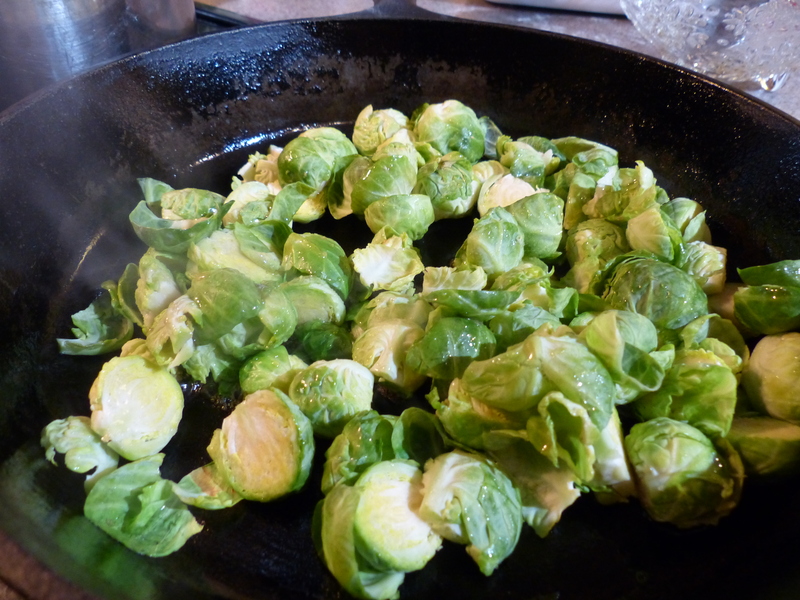 Sauté sprouts in oil on skillet over medium heat until barely tender – about 8 minutes. Stir occasionally to prevent sticking, but allow them to brown a little. Eat them. Served on a bed of bulgar and chicken. Once you have tried this recipe and have realized you do indeed enjoy this highly nutritious vegetable, scour the internet for more recipes. Try them roasted with small bits of bacon and walnuts. Or simply roast them with other roastable vegetables and your favorite herbs. 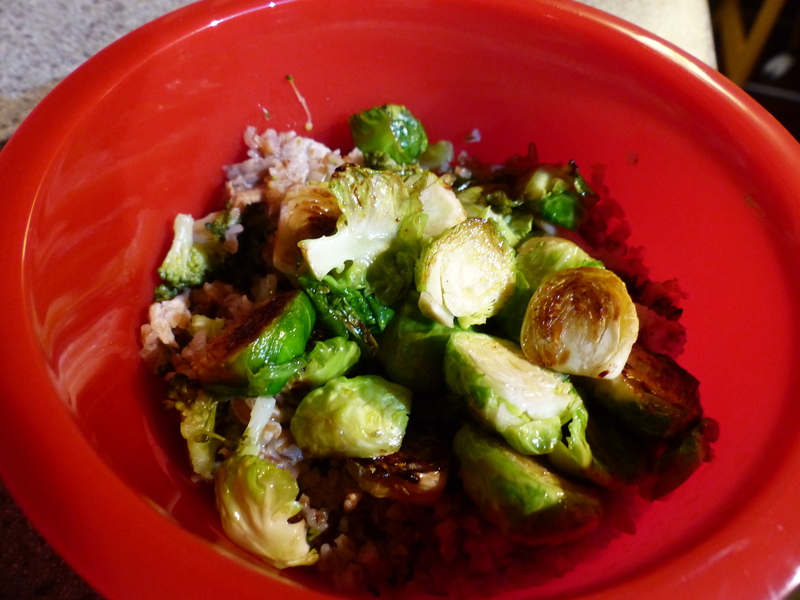 Do you have a favorite Brussels sprout recipe? You are welcome to share the link in the comments section! The several years we had them in our garden, we found they sweetened up after a hard freeze. Been known to leave the plants standing, pick and eat raw in January. And such unusual and interesting plants with the sprouts hiding under leaves along the tall stalk. After I wrote this I started thinking about growing them in my garden this year. Now I know I should! I imagined they would taste even better picked fresh from the garden. They’ll look interesting too. Maybe I should grow them in the bed in my front yard so passersby can enjoy their unusual display. I just found your blog through Marilyn Gardner’s, and I had to say… I LOVE Brussels sprouts prepared in a very similar way! My mom steams them to soften them and then basically stir fries them with garlic, olive oil, and salt. I INHALE them. Also, I loved your little bio on Marilyn’s blog with your guest post! I too am a TCK, and my husband is in the military, so it’s fun to connect with people who have those backgrounds as well! Welcome Becca! Thanks for the cooking tip on steaming before stir frying. I’ll have to try that. I’m a big fan of Marilyn’s blog too (www.communicatingacrocssboundariesblog.com) and she was very gracious to feature a guest post by me. Thanks for stopping by!